This is our first year carving a pumpkin as a family. 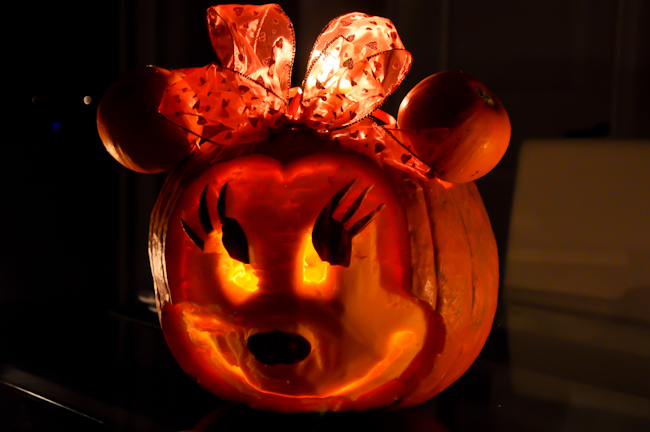 We ended up with a Minnie-O-Lantern. 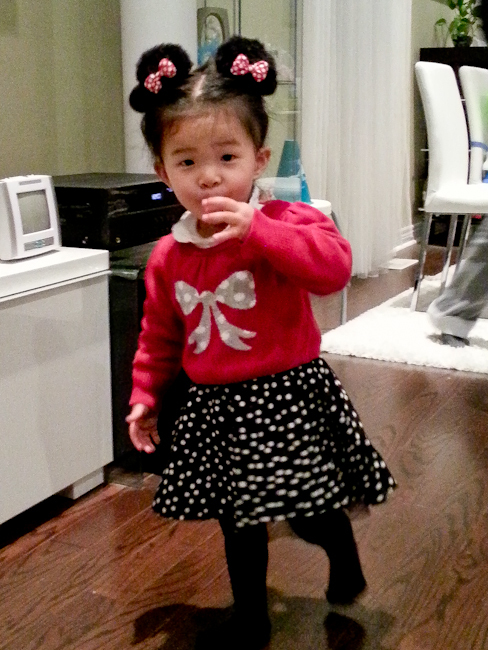 We pick Minnie Mouse because Glee will be dressed up as her on Halloween. We got her the Minnie ears during our Disney trip in April. We thought this will be a really great way to remember her first trip to Disney World! Elegant Japanese with a twist! Quinoa (ki-nwa) has recently popped up everywhere in restaurants and different brunch recipes. I wasn’t sure what it was or what it tasted like. I ordered it at the very first opportunity I had which was at a lunch cafe. The quinoa cucumber salad was really good and I loved its texture. I started looking into quinoa and found out that it is high in protein and dietary fibres. Not only that it tastes great but it is actually really good for you. I thought to myself I got to use it in my meal plan recipes somehow. The first recipe I used quinoa was Butternut Squash Stew. I was convinced that quinoa could be more than just brunch. Then I found this Teriyaki Salmon recipe. Instead of serving it with a side of white rice and stir-fry vegetables, it was done with a twist with quinoa added to the stir-fry. I made it for my family and they all commented on how elegant the dish looked and how good it tasted! Don’t let the fanciness fool you, it really takes no time to make it especially if you prepare everything in advance! The fish could be marinated in advance and refrigerated up to 24 hours. Quinoa can also be cooked in advance and stored in the fridge. 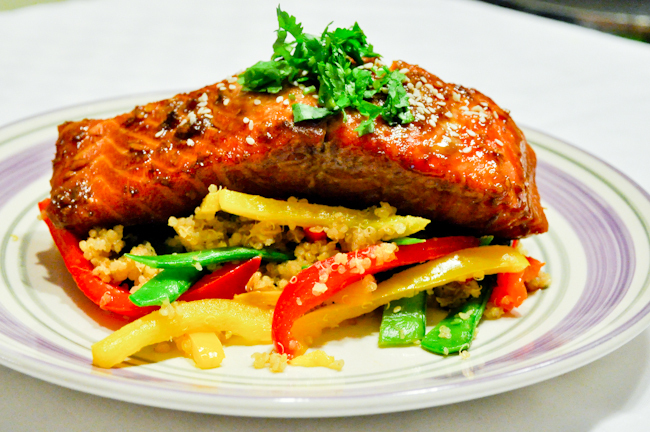 This way when it is time to eat, just bake the fish and stir-fry the vegetables with quinoa. It will take no time for an elegant Japanese dinner! 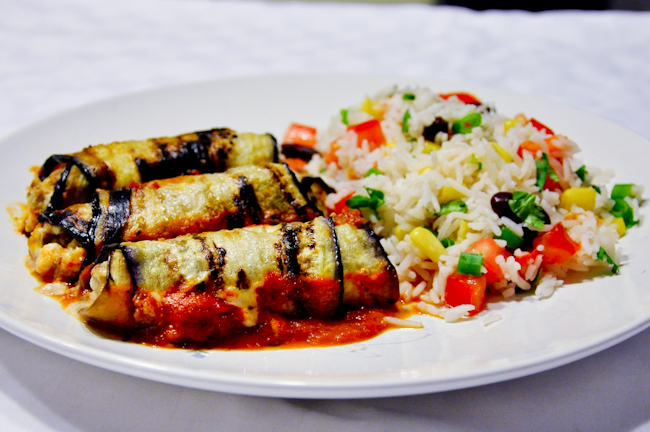 I was never a fan of eggplant because when I tried it as a kid, the taste was really strong for me. This made me stay away from eggplant for a long time. The one and only one dish I knew was how my mom used to make it. She would grill it, remove the skin and scrambled it with scallions and seasoning to turn it into a paste like dish. All the adults loved it, but almost none of the kids would touch it. What made me change my mine about eggplant was a Mediterranean dip my girlfriend, Elisa introduced me to. It was a causal lunch get together when I first moved back from Cambodia. She told me that a new Mediterranean restaurant just opened up near our area and she loved the food there. We went and she insisted on ordering the dip platter. She told me that the eggplant was really good and I had to try it! I thought to myself I would try it but I doubt that I would like it. But I went with it anyway. Besides the platter came with three different dips so I was safe. I wasn’t sure whether it was because I have grown up or the way they cook the eggplant, but the dip was surprisingly good! I couldn’t believe I would actually like eggplant. Thanks Elisa for convincing me to give eggplant a second chance! Otherwise I would miss out on it big time! I’ve been looking for different eggplant recipes, but didn’t come across too many to choose from. I find that eggplant is one of the harder vegetables to cook with. It is hard to come up with something that will go well with it. This recipe is really good and easy to eat! Glee loved it so give it a try and let me know what you think! I highly recommend slicing the eggplant, salt it and leave it in your fridge over night! When rolling the eggplant, start with the wider end. The wider end will hold the stuffing better and as it gets narrow, the roll will showcase the skin by creating a nice pattern to look at. Huan and Glee love ribs, so I would always try to do at least 1-2 rib recipes per month. 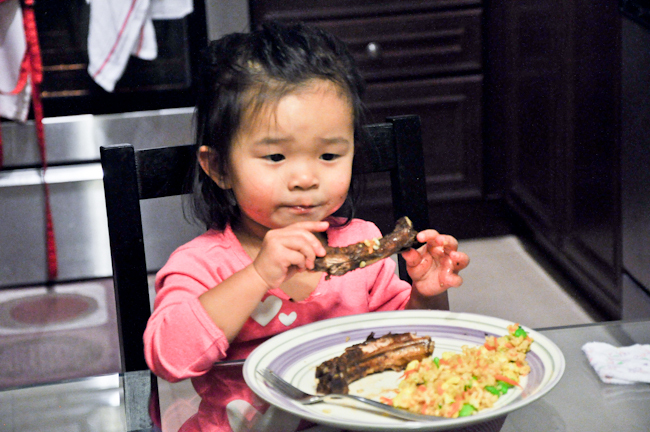 After scouting all the food blogs and recipe sites, I find Asian style ribs are more child-friendly. So I started to adapt from different recipes and modify for simplicity and less cooking time. Chinese cuisines have a wide range in cooking. That’s why you get such a wide range in prices when you order from restaurants. Chinese cooking is generally pretty intensive as there are so many ingredients in each dish. Although I am Chinese, I was pretty intimidated by Chinese cooking. I was always worried about not getting it right. No one would or could tell me what’s the secret to get the flavours into the meat so nicely. After cooking for awhile and with more and more Asian recipes readily available on the internet, I discovered a few tricks about Chinese cooking. Although it might seem like a lot of ingredients, they are always the same such as, green onion, ginger, coriander, garlic, soy sauce, fish sauce, oyster sauce and sesame oil. It is usually a combination of a few of the above ingredients for most dishes. As a new cook, I usually just poach my vegetables, pre-cook my meats and things in just boiling water. When I do that, all the flavours are left in the pot with the water leaving the meat bland tasting. The trick really is to add whatever the seasoning you are cooking with into the boiling water, so that your meat can soak up all the wonderful flavours. This way not only that your meat is tasty you will end up with a nice broth which you can serve as soup on the side. Most of the cooking time is actually in the preparation. Most if not all of the preparation could be done in advance so that it will take no time to cook when it comes to dinner time. All the pre-work could be done in advance. 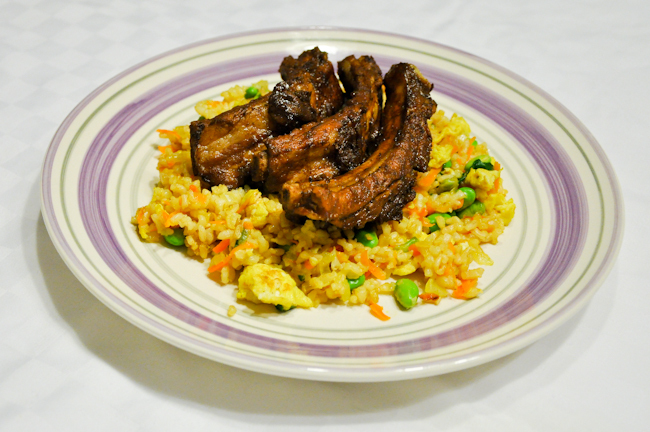 You can even pre-cook the ribs and rice the night before and store them in the fridge. If you prefer more flavours in your ribs, I recommend adding a pinch of salt while frying them with the ginger and green onion in step 5. That’s Why it is called Spaghetti Squash! 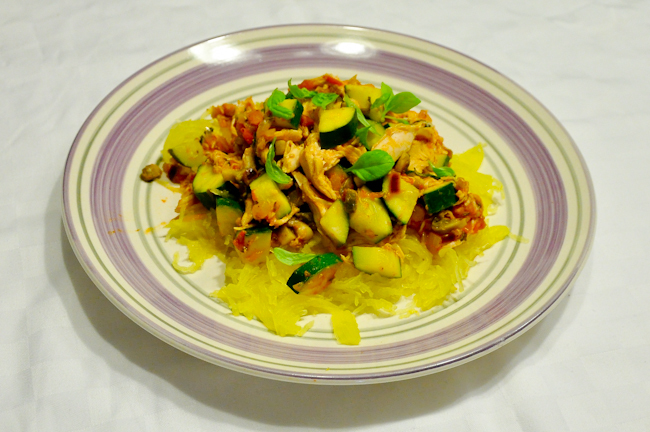 The first time I heard spaghetti squash, I thought the squash must go particularly well with spaghetti. Little did I know that when the squash is cooked, the flesh actually turns into spaghetti itself. It was pretty amazing and magical! The squash tastes really sweet by itself and the texture is just wonderful! This is a very light and healthy recipe. The original was vegetarian, but I like it so much I had to make it into a balanced meal so that Huan would eat it. It is perfect for people who are on a protein diet. When I finished cooking this meal, I couldn’t help but think of my wonderful friend, Kari. She’s like Huan who loves meat and eats very little carbs. So Kari! This one is for you! Thank you for helping me proof read everything on this site! I couldn’t have done it without you! This meal can be converted into a vegetarian meal, just cut out the chicken. If your kids love pasta as much as mine, just replace the spaghetti squash with a side cooked pasta. Chicken could be pre-cooked and shredded the night before to save time. Meatloaf has a huge range in taste. That’s because there are so many ways to make a meatloaf. Many restaurants have it on the menu but I am usually quite reluctant to order it because I don’t know if it will be a hit or a miss! 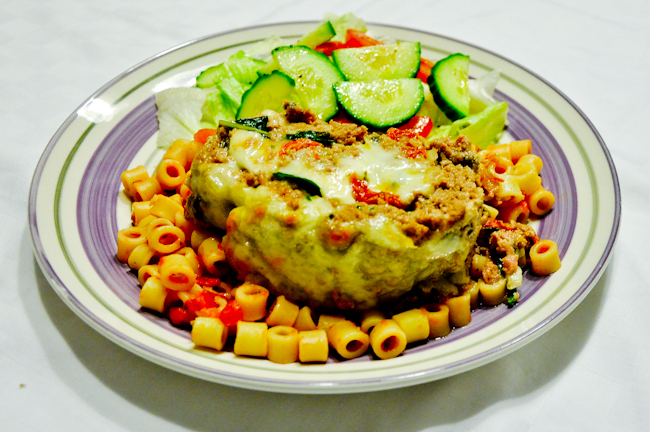 Meatloaf is one of my favourite recipes that I would make over and over again. That’s because I can be as creative as I want and try new flavours. I made several meatloaves before and I think they came out pretty good. But this Caprese Meatloaf definitely takes it to the next level! The sun dried tomatoes, fresh basil and mozzarella cheese in the centre made the whole thing taste that much better! The original recipe was a lot more time consuming. I simplified everything so that you and your family can enjoy this jackpot meatloaf without slaving in the kitchen. Let me know how this meatloaf knocks your socks off! If you don’t like sausages you can use ground pork or ground chicken. After you roll up the meatloaf, make sure you use a wider pan for baking to ensure shorter baking time with more exposure! I hope everyone has had a fabulous week! 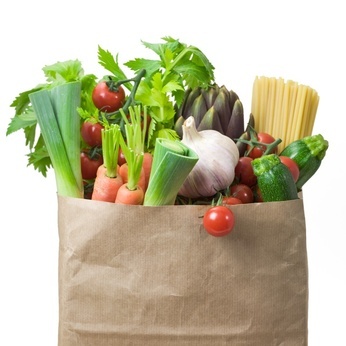 This week’s menu is full of variety and very flavourful. If you were to cook everything from scratch the day of, most of them will take 40 minutes to 1 hour. If you want to cut down cooking time, please read the cooking tips on each recipe so you can do the proper prep work in advance. 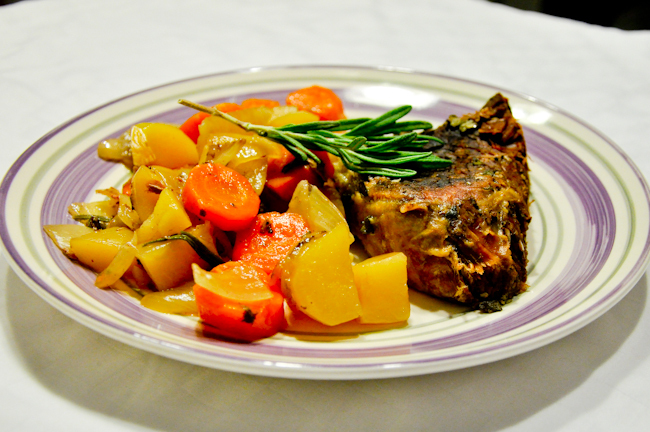 I can reassure you that this week’s menu will knock your family’s socks off! Here’s the shopping list for next week and this is what we are having for the week! Enjoy! Please double check your pantry to make sure you have the following items in stock. Cucumber, Cucumber, I love Cucumber! Cucumber is my favourite vegetable. I love it because no matter what I was craving, it would do the trick. I used to eat it as a fruit whenever we ran out of fruits. My friends thought I was really weird at first, but sooner or later I would convert them into cucumber lovers. I mean there is nothing else that I could think of to replace my love for cucumber. It is the perfect afternoon snack. If I was thirsty, I would just eat a cucumber. The refreshing juice quenched my thirst better than any water or juices. When I wanted a salty snack, I would cut up the cucumber into cubes and add a pinch of salt and eat it like a salad. When I want something sweet, I would wash it and just take a bite from the whole cucumber. The crunchiness was just refreshing and surprisingly sweet by itself. When I saw this recipe, I thought it looked so good already. When I found out that the sauce was cucumber based, I was all over it! When I tested it, I found the sauce a little too herb heavy so I did some minor adjustments to bring out the cucumber in the sauce without losing the herb flavours. This fish came with such fancy presentation, it is perfect for entertainment! 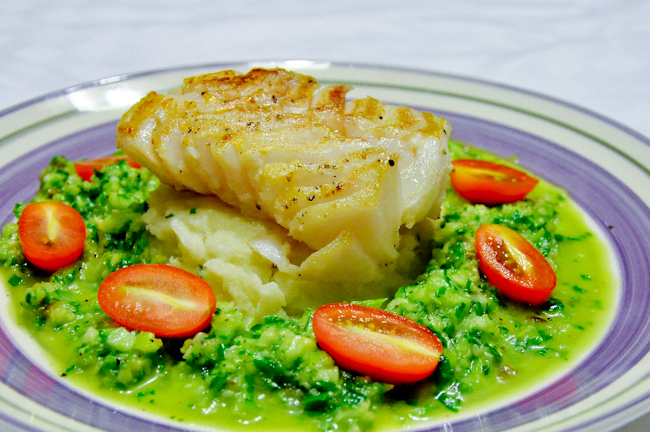 I am sure your guests will be impressed by the look, smell and taste of this fish! The sauce needs to be chilled so you can do it up to 24 hours in advance. The mashed potatoes can also be prepared in advance and be refrigerated for up to 48 hours. When it comes time to serve, you can either serve it cold with the hot fish, or if you like your potato warm, just heat it up in the microwave before putting on the cucumber sauce and fish. To Slow-Cook or Not To Slow-Cook?! For the longest time, I was contemplating on whether I should get a slow-cooker. I heard mixed reviews and the price tag just didn’t seem worth the risks. I held back until last year when I went cross border shopping, I saw one for $29.99(compared to $69.99 and up) from Target so I bought it. It came with a few recipes which I tried and failed miserably. Huan complained about the meat being too dry and the vegetables were too mushy and all the flavours were just not the same. I thought I was just not your slow-cooker kind of girl so I was ready to give up! However, part of me couldn’t deny that it was quite convenient on those busy days where you need to run around and when you come home at dinner time and your dinner is ready in your slow-cooker. I thought over cooked food is still better than fast food. So I decided to keep the slow-cooker for those days. I decided to spend some time trying out more slow-cooker recipes. I was successful in several occasions with pot roasts. I then realized that the trick to good slow-cooker pot roast is to sear the meat on all sides before you set it up in the cooker. By doing so, you are sealing the meat so that the juice is locked while being slow-cooked. So the meat stays moist. Also, if you are like Huan who likes texture in your meat, just cut down the cook time to avoid over cooking the food. 40 minutes(on low) and 20-30 minutes (on high). I chose this recipe because it is yummy and so flexible. See cooking tips below! If you have more time, you can do the roast as is and that would take slightly over an hour in the oven. My version was to cut the roast in half, slashing the roasting time in half as well. Also the fact that everyone wants the end piece on a roast, this way all pieces are end pieces. If it is one of those slow-cooker days, what you need to do is to just sear the roast on all sides before putting it into your cooker. High: 3-4 hours Low: 5-6 hours. How to get your Kids to eat?! I received many comments about kids’ meals. A lot of parents I know are having trouble getting their kids to eat. The general consensus is they wish someone could just tell them what to cook so that their kids would eat. Many suggested I do a kids section with kids’ menu. I chose not to have a kids section because I personally believe that kids can and will eat anything. The trick is how we adults present the food to them. I try to make all of my dinners kid friendly. Believe it or not, Glee eats most of the food on Gleeful Gourmets. So I thought I shall share our experience with everyone! Try it! – One of our philosophies with food is that Glee has to try it before she decides whether she likes it or not. If she ends up not liking it, we won’t force her to eat it. When we first asked her to try new food, her automatic reaction was “No!” You will get many “No’s” before they will open their mouth, but don’t give up or force it. Instead, eat it yourself and usually that will do the trick because kids just want to eat whatever their parents are eating. If not, just explain that it was really good and you want them to try it and if they don’t like it, they don’t have to eat it. One thing at a time – The other trick is to introduce only one new thing at a time. As long as Glee recognized most of the things on her dinner plate, she would start eating the food she’s familiar with. After she worked up an appetite, she will try the new thing. Tell them what they are eating! – We take this opportunity to teach Glee her vegetables and meats. We find that after she learned she was able to tell us more and more of what her likes and dislikes which made it easier and easier for the future. Last week, my nephew Kyle came to sleepover. I’ve chosen this spaghetti recipe to ensure a successful dinner because I know all kids love pasta for whatever reason. The only thing in this recipe that was new for Glee were the shrimp. 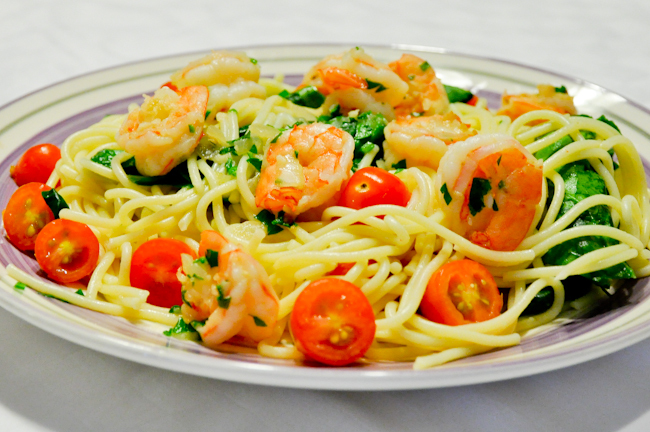 Of course both started off with the spaghetti and worked through the shrimps. They loved it and both had seconds! Maybe I am very lucky as Glee is an adventurous eater, but I believe all kids are curious and love to learn. Food is no exception! So give these tips a try and let me know how they work out for your family! You can use any pasta really. So don’t sweat to get spaghetti, just use whatever you have on hand. If you child is not yet an adventurous eater, I would skip the parsley. Also, if you want it as leftover, store the sauce and pasta separately. When it comes time to reheat, heat up the sauce and pasta then toss.